Despite claims that conditions are improving at Cambodian garment factories, almost 300 people were taken ill last week and worries about persistent discrimination and forced overtime remain. 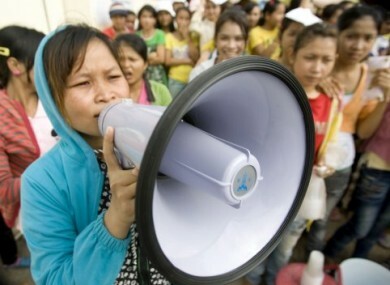 Factory workers held strikes last year to fight for an increase in their monthly salaries from US$61 to US$93. The minimum wage remains at $61 however. SWEDISH FASHION RETAIL H&M has said it will launch an investigation into fainting incidents at a Cambodian clothes factory which provides some of its knitwear. Nearly 300 employees at the M&V International Manufacturing Ltd. factory fell ill last week, according to the local newspaper, the Phnom Penh Post. According to the local daily, 284 workers fainted over two days – 86 on Tuesday and 198 on Thursday. Another 40 workers fainted at a separate factory in the Dangkor district. Prime Minister Hun Sen has ordered Ministry of Labour officials to quickly investigate and resolve the problems leading to the mass faintings. Meanwhile, H&M has said it is aware of the “discomforting incidents” and it is “preparing for a for a thorough in-depth analysis”. The popular retailer added that no “plausible causes” had been found yet. According to the local media, some workers at the Kampong Chnnang factory claim they have had to work up to six hours overtime a day for the past two months. Union representative Norn Leakhena told the Phnom Penh Post that bosses at the factory also forced workers to stay in the factory until 11pm from January to March. According to the Union, people regularly faint while in the factory, particulary when they are working near the laundry room. Management at M&V International Manufacturing have denied the allegations of forced overtime and a “toxic” working environment. One executive told the local reporters that the fainting was caused by “poor health” and a “strange psychological phenomenon”. “In China, this kind of thing is unthinkable. We cannot understand how this happens so often in Cambodia,” the unnamed executive reportedly said. The workers don’t pass out at once, they pass out in succession. One worker passes out, and when another sees this and she passes out, then another and another and another. It is beyond my comprehension. Workers affected by the fainting were told to take the rest of the week off but return to the factory for duty today. More than 324,000 people are employed in registered garment factories in Cambodia. The industry, which is a driver of the country’s economy, offers an average pay of about US$61 per month. Overall conditions in Cambodia’s 276 factories have been improving, according to the International Labour Organisation’s Better Factories Cambodia initiative. Earlier this month, it released a report to say that compliance with international labour standards remains “generally high”. However, some areas of concern remain with the group particularly worried about discrimination, forced overtime and occupational health and safety. The industry was hit hard by the global recession with workers feeling the pressure of reduced hours and lay-offs. The sector is once more adding workers and Better Factories says it is important to continue to pay attention to improving workers’ conditions and management relations. In some positive developments, no forced labour was encountered by ILO monitors and no workers were confirmed to be below 15-years-of-age. The report looked at 186 of the country’s 276 factories that hold export licences. It found that 97 per cent of those were complying with the US$61 minimum monthly wage. However, workers’ unions have argued that the amount is not nearly enough to live on. Last year, massive strikes were held across the country with men and women demanding a new minimum wage of US$93. However, the group also warned on August 8 that actions needed to be taken to avoid further faintings at the country’s garment factories. M&V International Manufacturing Ltd, the Macau-owned company which runs the factory involved in last week’s incidents, also produces clothing for Benetton, Topshop and Next in China and Cambodia. However, the Kampong Chnnang operation makes clothes exclusively for H&M. The ILO-backed Better Factories programme sent monitors to the plant earlier this month but there will be another inspection carried out soon, the group’s communication officer Ying Bun said. Email “H&amp;M to launch probe after workers faint at Cambodian factory”. Feedback on “H&amp;M to launch probe after workers faint at Cambodian factory”.